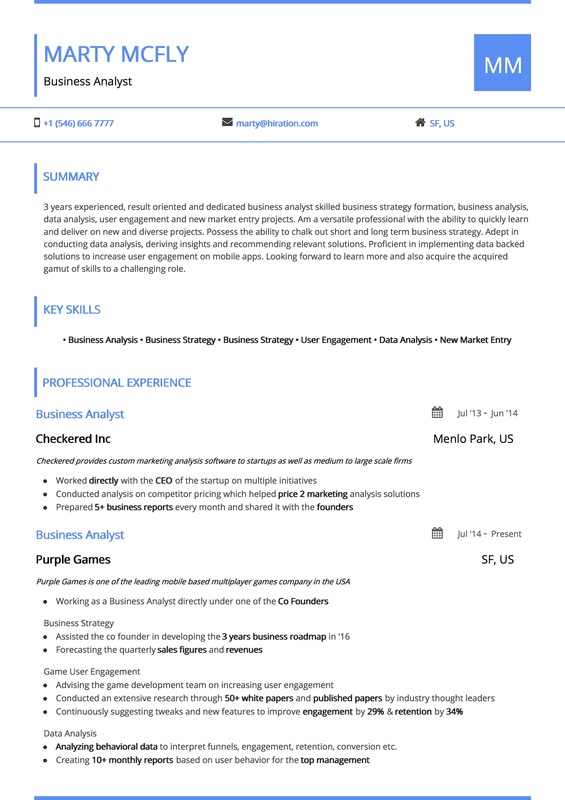 Premium: The Material Color Template is a premium template on Hiration's Resume Builder. Structure: This resume template is a single column template, with a lot of contemporary features to provide a professional as well as modern look to the template. The template also carries a resume signature in the header, which you can use to sign the resume with your initials. The inter section spacing has been kept a bit on the higher side to make the document readable for any recruiter. Also, the use of bars has been done in the resume header and footer to give it a signature look. This focus on headings is sure to get you noticed! This resume template is for somebody who is struggling to find content in their resume - a fresh graduate would, early level professionals, etc. Design: A very contemporary blue from google's material template (hence the name) has been used for headings in the resume. The sub-headings in the dated sections of the resume have been provided in two lines with the company and dates in the first line and the designation and location in the second line. This is a very professional template and is very easy on the eye as well. Typography: Open Sans along with a a high line spacing has been employed to make the text easy to read.